But I had overestimated my wrapping needs, and ended up using only about half of one roll that Christmas. 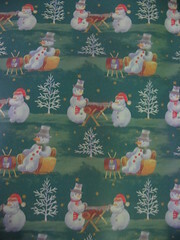 Ever since then, this has been my standard gift wrap for everyone, and so it shall be till it all runs out. I’m down to a roll and a half at this point, but I’ve been getting lazy and just using gift bags, so I may be with these snowmen for several Christmases to come yet. 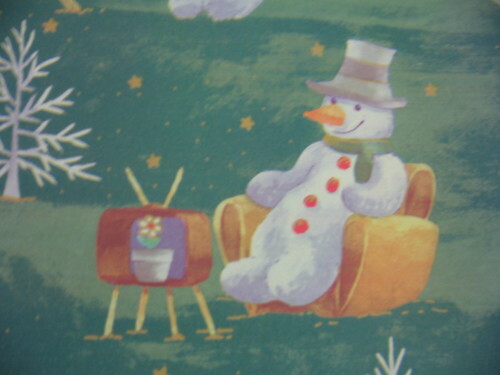 This snowman sitting in an easy chair would appear to be watching television. But wait. Look again. That’s not a working TV — it’s an empty TV casing, complete with rabbit ears, with the back cut out, and a potted flower placed behind the glass. Get that? This snowman is smiling at a fake, hollowed-out TV with a plant in it. And that plant’s looking pretty healthy for the dead of winter, which means it’s fake too. “Flower” here looks to be a few snow bricks short of an igloo, if you know what I mean. I get the impression that the two Happy Wood Choppers up there are a bit tired of his crazy, idle ways, and might just be planning to cut short his entertainment with an early thaw — perhaps to them, an act of kind mercy. 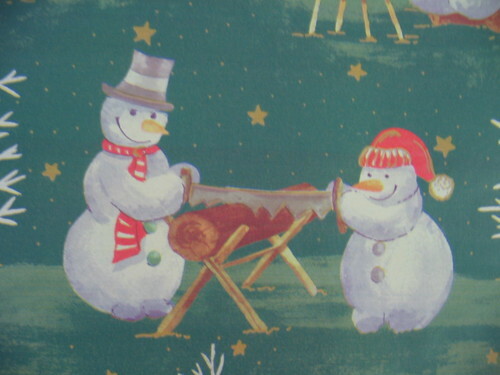 So what implicitly morbid scenes are on your gift wrappers this Christmas?